Whatever you do, do not try to detangle a shrunken fro. You might end up in tears or maybe even with a pair of scissors. A dry shrunken fro is a detangling disaster. If you have worn your hair in a stretched style, it’s best that you detangle your hair in that state before saturating it with water. Stretched hair is easier to handle because our coils and curls are slightly looser at this point. You can stretch your hair using two strand twists or plaits. You might even try the banding method or African threading technique. Remember, stretched hair is less prone to breakage and single strand knots (ssk) or fairy knots. This is an important follow-up to part one. If you’ve worn your hair in a stretched out style, simply unbraid and detangle each section before moving on to the next. If you’ve been rocking a stretched out fro, you probably want to gently use your fingers to section your hair into 6-8 parts. Braid up each section and hold it back with hair tie or a few bobby pins. When you are done, take down one braid, and completely detangle it before moving on. This not only ensures that each section is completely detangled, but also preserves your sanity. 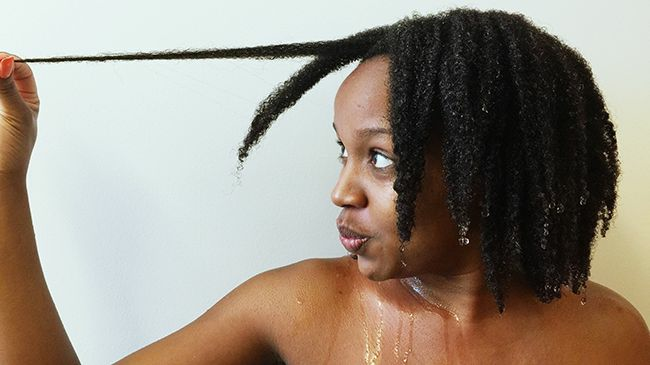 Now, there’s lots of sway among naturalistas on this particular aspect of detangling. 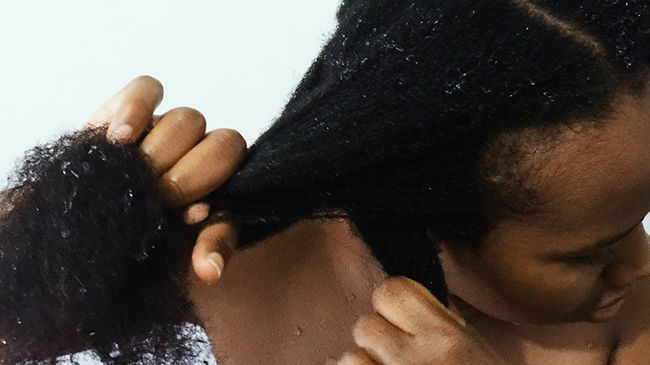 Some naturalistas rave about detangling products that add slip to their hair and melt away knots. These detangling products vary in composition, but most are water based. Other naturalistas say that a light oil will do the trick. I have found that whether water or oil based, adding product to my hair greatly aids my detangling process. I simply apply olive oil along the length of my slightly damp hair and proceed to detangle it. I leave the olive oil on overnight to serve as my pre-poo. I wouldn’t advocate for dry detangling, as the friction between my hair and my fingers causes unnecessary damage and breakage. Read more: What is an Emollient? There is a vast array of combs and detangling brushes available releasing knots. I have opted to use my trusty ol’ fingers. Brushes cause too much friction and prominent seams in combs can cause excessive damage. My fingers are more than enough when it comes to regular detangling. Detangling using my fingers takes longer than raking a comb through my hair, but it helps me to retain length. If I must use combs on my hair, I only do so monthly or quarterly. This is absolutely crucial. The ends of our hair are the most delicate and prone to damage because they are the oldest. It is critical that you nurture your ends if you are serious about length retention. Remember, the oldest parts of our hair have suffered lots of mechanical damage already from simple wear and tear, so treat them like silk. Do not forget to moisturize and seal regularly with a moisturizer and oil or butter of your choice. Detangling is a time-consuming affair. Make sure you allocate adequate time. It takes me two hours to fully detangle my waist length hair from tip to root. I fully detangle my hair once a fortnight, depending on my protective styling routine. On detangling days, I make sure I have my stash of movies on hold - this makes an otherwise exhausting process, more enjoyable. How’s your detangling process? What are your favorite products or tools and how do you use them?